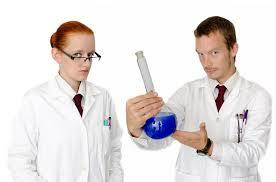 ﻿Does the word science make you think of high-tech labs and researchers in white coats like the ones in this picture? This is often an accurate image of science but not always. If you look up science in a dictionary, you would find that it comes from a Latin word that means “having knowledge.” However, this is not an adequate definition either. logic. In other words, science is a process, not just a body of facts. Through the process of science, our knowledge of the world advances. The Goal of Science. Scientists may focus on very different aspects of the natural world. For example, some scientists focus on the world of tiny objects, such as atoms and molecules.